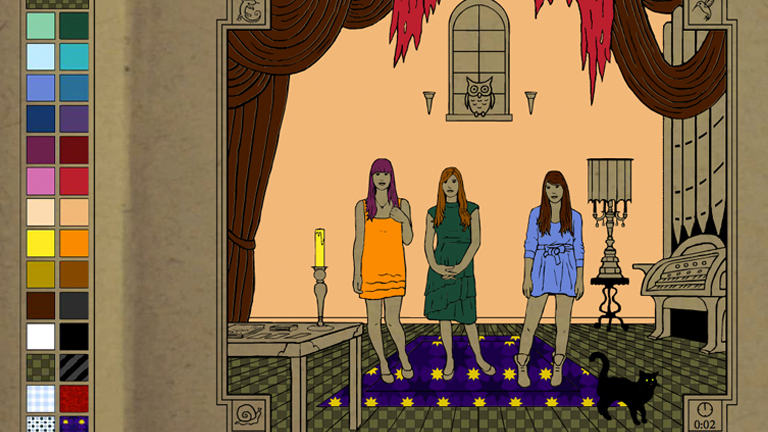 “Knight of Wands” is an interactive coloring book music video for Au Revoir Simone. With a simplified Paint interface, the project allows users to choose colors for the room, clothes of the band members, and even the non human beings. Take care though, once you color the cat, it will become more active! Be creative and share your masterpiece via Facebook, Flickr, or Twitter or simply save it as a jpg. The video directed by fourclops::) premiered on Mashable and was nominated for “Most Innovative Music Video” by the O Music Awards. “Knight of Wands” is an interactive coloring book music video for Au Revoir Simone. With a simplified Paint interface, the project allows users to choose colors for the room, clothes of the band members, and even the non human beings. Take care though, once you color the cat, it will become more active! Be creative and share your masterpiece via Facebook, Flickr, or Twitter or simply save it as a jpg. The video directed by fourclops::) premiered on Mashable and was nominated for “Most Innovative Music Video” by the O Music Awards.